60+ years old, and full of traditionally Taiwanese food from start to finish. Recently awarded a Michelin Star in Michelin’s first outing in Taipei. In Tianmu’s East Road, Golden Formosa is very popular and I would definitely recommend you to book in advance (see below for phone number). Just give me a bowl of this with rice and I I’ll be happy. Lightly spiced, rich, thick sauce, silky smooth tofu with a nicely seasoned skin on it. This really is a top dish. It may seem quite expensive initially (and it kind of is) but the amount of things inside this pot is nothing short of eye-popping. 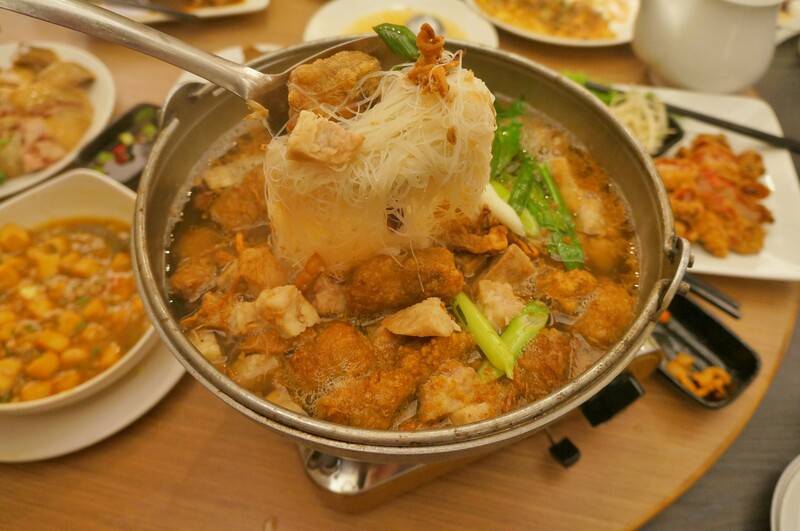 Expect to pull up some deep fried fish chunks, some meatballs, chunks of different fish and noodles a-plenty. Bam! Crispy fried pork, no grease stains in sight, meat juices (the good kind) explode in your mouth when you crunch down on the crispy exterior. The meat is seasoned beautifully and has a slight sweetness to it. The batter is also seasoned with plenty of pepper, making it fragrant and lightly spiced. Another solid dish, see a pattern emerging here? I’ve had these in NingXia night market and loved them. Basically, taro is made into a thick paste and a dried egg yolk is used as the centrepiece, with the thick taro paste moulded around it. Lightly dusted with a nice batter and then dropped in the fryer for a short time, these are something special. Expect a crunchy exterior, soft filling, with that kind of savoury sweet flavour that taro often packs. Egg + oysters = heaven. Again, a special from NingXia night market, this one is slightly crunchier on the outside with less sauce (a good thing, definitely a plus point in this ones favour!). Lots of oysters, delicious flavours running throughout, and plenty of sauce to boot. It was solid, but I kind of felt it didn’t go with the rest of the meal. Perhaps that was our fault for ordering it, though. Arguably my favourite offal, intestines tend to have a slightly chewy exterior whilst they’re soft and fatty on the inside. It’s all about what they are cooked in, though, and these delivered on so many levels! Salty and deep-flavoured braising sauces are served up with this plate of moreish goodness. Highly recommend. You always need some greens to wash down the saltiness of the other dishes. We chose these stir-fried water lotus for ours. Not often a dish we order, but a good choice. Fried up with some shallots, this hit the mark. Stewed in a slightly salty sauce, the bamboo retained a nice fresh crunch. Good chicken, yummy chicken, delicious chicken, tasty chicken. Recommended chicken. Avoid if you don’t like bones. You have to order this. Just incase that wasn’t enough of a persuasion, I will tell you what to expect when you finally get these onto your chopsticks: crunchiness, saltiness, natural sweetness of the pork, delectable addictiveness. The interesting thing about Golden Formosa’s Michelin Star, is that it is completely different to the Michelin Stars of other restaurants around Taipei, such as MUME. With MUME you expect intricate and expertly executed dishes served up with an explanation and description. Here, at Golden Formosa, you should expect big portions of rustic Taiwanese dishes served up with a smile. Excellent, from start to finish. Opening Times: Tuesday – Sunday 11:30 – 14:30 and 17:30 – 21:30.